Done in durable laser cut birch, measuring 18 cm from side to side and 5 cm tall, it's the latest and greatest game accessory for your dice rolling convenience. 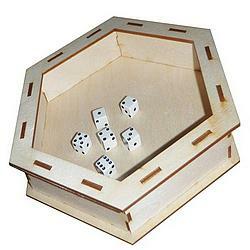 Keeps the dice off the game and off the table. Light, durable, easy to use and pass around the table. Ready to go out of the box, no assembly required. Light, yet durable, it can be used out of the box or you can paint/stain/decorate it to your own design. Light, Portable, & Durable! 3mm thick Birch Wood. Comes fully assembled, customize or use right away! Roll your dice in style!